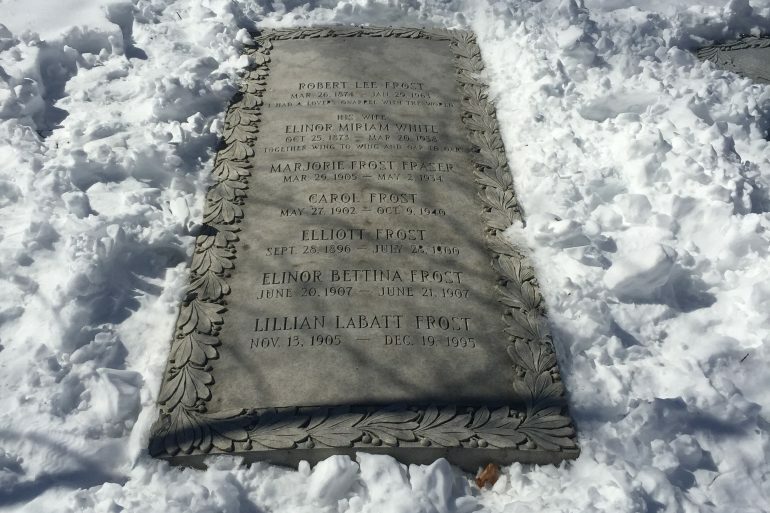 I had been to Robert Frost’s grave before, but never in snow, and he’s always struck me most as a winter poet. Yes, he addresses autumns and apples and mud season and boys swinging on birches on warm summer days, but so much of his work is in winter—the woods where he stops on a snowy evening, the old man alone on a winter night, the patch of old snow that resembled newsprint. Even the hair in his most famous photos—that shock of pure white like snow freshly fallen and scattered by a wind. There are photos of him as a younger man, but we hardly ever see those. It’s usually those photos of him as an old guy we see, reading at JFK’s inauguration or sitting on a New England stone wall. He looks gentle, avuncular, reassuring, unlike his poems which are rarely reassuring. His life was far from easy, a hardscrabble existence to make ends meet for so many years, the premature death of children, one son from suicide. And yet, he found ways to turn heartache into beauty, to find beauty in a hard world, but never turning away from the world, always looking deeply into it with an unblinkered stare, knowing full well that that creamy New England snowscape that looks so idyllic and sublime could kill quite quickly in a multitude of ways. His grave rests in the Old Bennington Cemetery next to the First Congregational Church in Bennington built in 1762, also known as the Old First Church, a white, wooden building stunning in its gorgeous simplicity like so many of those Congregational Churches throughout New Hampshire and Vermont, their white, wooden steeples the tallest buildings in most of those towns, poking up into the sky with a mountain backdrop of green summer, white winter, and the colorful explosion of autumn. 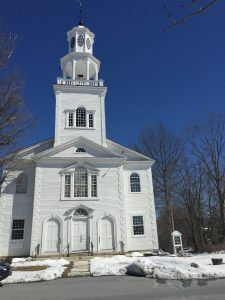 The church and cemetery sit about half a mile from the Bennington Monument, the tall stone obelisk built in honor of the Battle of Bennington, a key victory in the American Revolution for the upstart colonials. I was with my teenaged son and our neighbor’s teenaged daughter, neither of whom had any interest in leaving the warm car to join me out in the clear, biting winter morning. 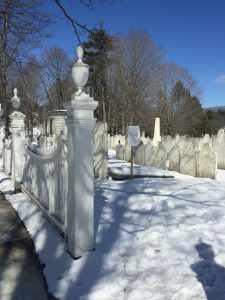 The grave is a little ways behind the church, straight back and to the right through the smallish cemetery containing a few hundred tombstones, some of other famous Vermonters, including William Ellery Channing, the Father of American Unitarianism. Many of the stones are so old that their engravings have been rubbed smooth by centuries of the elements, the vanquishing caress of wind and snow and rain. Frost’s grave, however, is the only one with green signs pointing the way. His stone lays flat and lists his name, his wife’s (whom he outlived by almost thirty years), then the list of others—children, siblings, grandchildren. Below his name is the inscription, “I had a lover’s quarrel with the world,” from his poem “A Lesson For Today,” one of his lesser known poems and rightly so. 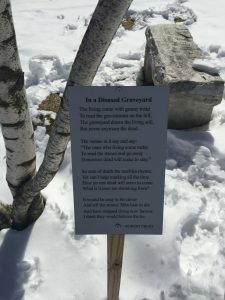 Very near his grave, though, is a small sign with his poem, “In a Disused Graveyard.” I stood there in the snow and read the poem a couple of times, alone, the wind and the dead my only companions. “You a student?” I asked. He said he was, at Cornell. His friends soon joined, three girls and another boy, and they were all better dressed for the weather. Perhaps I should have known better than to have been shocked, but I was shocked. I am not one who grumbles about the younger generations—I’m quite heartened by their general intelligence and serious engagement with the world. Nor am I one of those who sits around wishing more people read more serious literature, as if there were some halcyon past in which great swathes of the American population were regularly digesting the likes of Thoreau, Cather and Faulkner. From what I can glean, most Americans have never been huge readers, especially of literature. But Ivy League students, or any college students, not reading anything by Frost? I was surprised. I would have been depressed, but I recalled that in sixth grade, my son was made by his teacher to memorize, “Stopping by the Woods on a Snowy Evening.” So some were out there reading him still, and some teachers were out there teaching him to non-English majors. Frost’s first book, A Boy’s Will, was panned by critics, and Ezra Pound, a difficult man and esoteric poet, lambasted the critics, saying basically that he understood why they didn’t like his, Pound’s, poetry, but how in God’s name could they be so stupid as to not see how great Frost’s poetry was? Not only great but accessible? “Give us an example,” another girl said. “Give us another,” the first boy said. I could have gone on and on. I could have discussed the sad line of “Good fences make good neighbors,” from “Mending Wall,” or I could have talked about an abandoned pile of chopped wood in “The Wood Pile” and how it signals that something bad must have happened to whomever cut it because nobody does all that work to chop all that wood and never use it, or I could have discussed those moments of transcendent perfection that are defined, in part, by their fleeting nature, such as is discussed in, “For Once, Then, Something,” or I could have talked about Frost’s directive in “Directive,” in which he’s begging people to abandon the strictures of life and go get lost somewhere, even if just for a day, an idea even more crucial now for our souls and sanity, given the prevalence if iPhones and their ability to make sure that someone somewhere is always tracking you—where you’re going, what you’re saying and what you’re doing. But I’d done enough quoting and lecturing for the day. The next day, I was in Williamstown, Massachusetts, and we stopped in at Nature’s Closet, a great outfitters store we always visit whenever we’re in the area, in large part because of the large old black lab who hangs out in the store. The dog belongs to the owner, a middle-aged lady with dark hair who is a blast to talk with and who has steered me towards some great products such as my North Face boots and Patagonia boxer shorts. Anyway, as I talked with her while my son and our neighbors’ daughter played with the dog, I mentioned that we’d been to Frost’s grave the day before. “I have his bench,” she said. He was a great poet. And one of these days I will read his poems while sitting on that bench and smoking a fine cigar.